The market for disgruntled All-Star Jimmy Butler is heating up and it looks like the Miami Heat are at the center of it all. 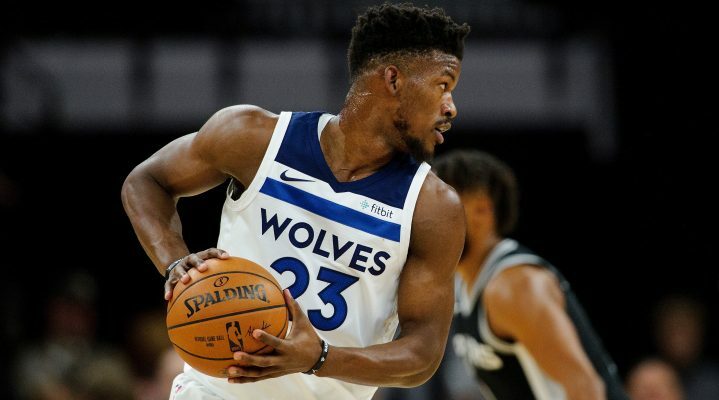 “An executive with another Eastern Conference team said he believes Miami is the leading contender for Butler but that wasn’t based on anything the Wolves have told him. There is little mystery why Spoelstra and Riley would want to bring Butler to Miami. If Butler were to join the Heat, he would arguably be the best two-way player the Heat have had on their roster since LeBron James left as a free agent back in 2014. Last season, Butler averaged 22.2 points, 5.3 rebounds, and 4.9 assists per game. He is also widely considered to be one of the best defensive stars the NBA has to offer. It remains to be seen what kind of package the Heat would put together in order to acquire Butler, but it stands to reason that they would have to part ways with a combination of rotational players, potential stars, and future assets. These are exciting times indeed for Heat fans everywhere and it’s beginning to seem as though bringing Butler to Miami is quite possible. Now all fans have to do is wait and see if the signs pointing to Butler ending up in Miami are pointing in the right direction.